For those of you who prefer a minimalist approach to controls, the Anthem SL delivers the same groundbreaking studio mic’d fidelity as the Anthem in a streamlined format with a single volume control. The endpin preamp has all-discrete circuitry for the purest signal and the TRU•MIC is premixed with the Element for optimum performance. FEATURES: Anthem TRU•MIC carries the majority of the guitars’ frequency range while the Element Pickup carries only the lowest frequencies. The mic is highly feedback-resistant. Noise cancelling microphone technology eliminates any annoying honky or boxy qualities from the inside of the guitar. Mic installs easily on the bridgeplate with peel and stick adhesive. Mic and pickup levels preset for optimum performance. 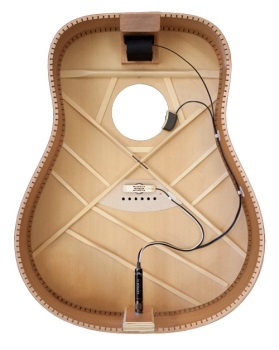 Soundhole remote includes volume and mic trim controls. All discrete pre-contoured endpin preamp with preset crossover. Element Pickup fits most common string spacings and saddle width. Comes with battery bag for secure and unobtrusive battery retention. Patent-pending.